Most countries have their own distinct forms of accommodation. In England it's the village inn, in France the gite, in Mexico the hacienda and in Spain the finca. 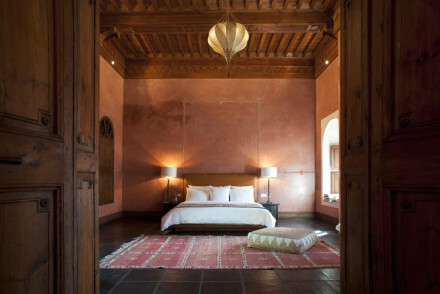 In Morocco we have the Marrakech riad, though they can also be found in Fez, Essauoira and elsewhere, but they are most identified with Marrakech. Over the years, many Marrakech riads had fallen into disrepair, but recent times have seen their resurrection, and reinvention, as exotic places to stay for visitors. 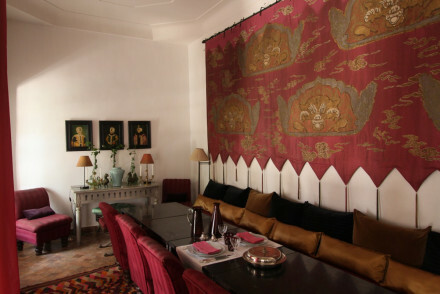 Ironically, those who perhaps have appreciated the style of these Marrakech riads the most have been the visitors themselves, so many of them have been bought by French and German fans of riad life and developed by them into hotels and restaurants. It has to be the souk, for spices, rugs, shawls, fabric, tactile rounded clay and wooden cooking utensils, lamps, lanterns and the all important items that you don't know you need until you see them. Haggling is vital and expected so don't be shy to offer half or less the first suggested price. If noisy busy shopping environments are not your idea of fun, go anyway for the enjoyment of returning to your Riad and marvelling at the instant calm and quiet. Even Riads which are right in the bustling medina manage to pull off this impressive trick. With the huge popularity of North African food based around slow-cooked tagines and cous cous, there are now many excellent cookery schools and classes in Marrakech. Many of us think of cous cous as a quick easy alternative to rice - in Marrakech you can learn how to take three hours to prepare the most delicious cous cous you have ever eaten. 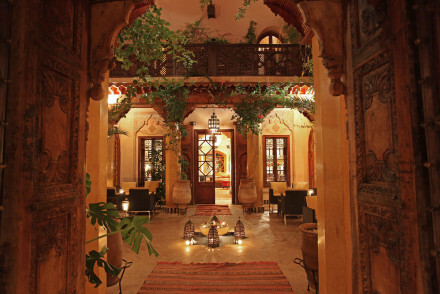 Dar Les Cigones, Dar Tchaikana and Dar Fakir are among our recommended Riads which offer cookery classes. The Faim D'Epices and La Maison Arabe schools are also popular. Here's a selection of Marrakech riads we recommend as places where you are likely to get the most authentic, historic atmosphere. Many of these have been bought and restored by art dealers and collectors so it's not just the buildings that are special, but also the art collections within. For a full list, consult the best hotels in Marrakech, or see our article on the Marrakech Medina for more guidance on staying in these truly authentic riads. 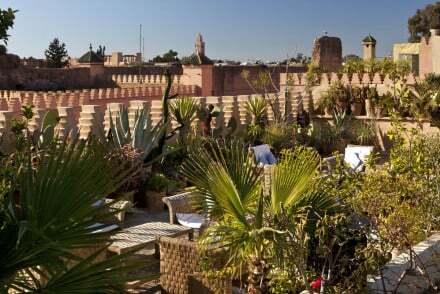 These Marrakech riads have been converted from classic historic buildings, and all include the traditional interior garden as well as wonderful roof terraces. There's nothing more magical than eating traditional Moroccan cous-cous or tagine while reclining on silk cushions by the light of flickering candles in the courtyard at night, perhaps beside a limpid pool - or waking up to the heat of the day over croissants and coffee on the rooftop. 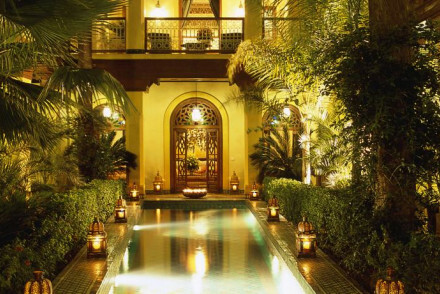 For small family groups or special occasions, you can often rent the whole riad exclusively, and the following riads are amongst the smallest and most imtimate, ideal for hiring for a weekend. Carefully displayed artworks at this minimalist-chic hotel in the heart of the medina. 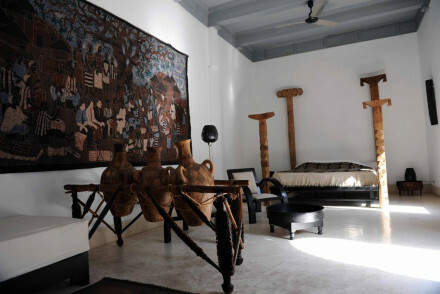 Stark white walls, authentic pottery and classical music in the communal areas. Great breakfasts and views over the city towards the mountains from the roof-top terrace. 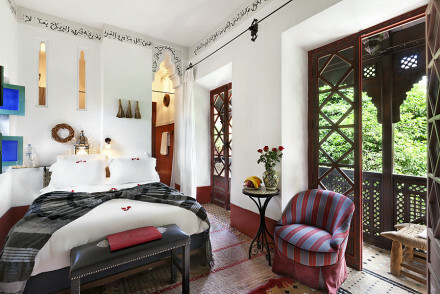 A perfectly designed riad. 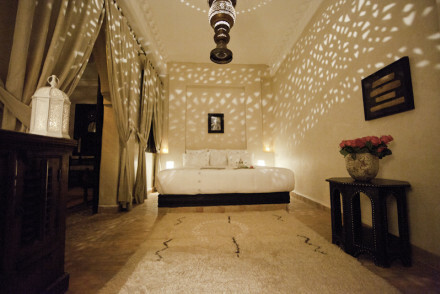 Total relaxation - Cool suites and leafy rooftop dinning offer a completely serene haven in the heart of busy Marrakech. Great walks - Head out into the winding alleys and streets of the Medina and wander, it's a great place to get lost and discover hidden jems. Local markets - Trawl the Marrakech souks for deals on carpets, jewels and leather goods. Sights nearby - The Koutoubia Mosque and gardens are only a 20-minute walk away. Boutique hotel with an elegant aristocratic ambience. Its understated style avoids fake orientalism. 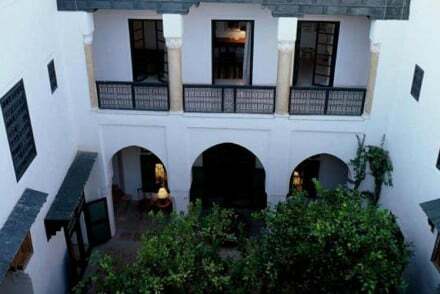 It provides authentic peace and harmony with simpler white washed walls, orange trees, and a beautiful inner courtyard. Hideaway - An intimate spot with only 5 rooms.